JERUSALEM (CNN) -- The tunnel whose completion sparked clashes Wednesday between Israelis and Palestinians snakes through Jerusalem's exotic past -- and along some of the city's most sacred sites. Formerly an underground waterway, the pedestrian tunnel was carved more than 2,000 years ago out of Jerusalem's formidable rocky core. The pedestrian tunnel is about 500 meters (yards) long and links the Western Wall, the holiest shrine of Judaism, with the Via Dolorosa, the route Jesus is thought to have taken on his way to his crucifixion. The Western Wall is the last remnant of the complex that housed the Biblical temples. Tourists entering from the Western Wall plaza first walk about 200 meters (yards) through a series of medieval and Roman halls at different levels. As they proceed, they enter a narrow, long tunnel. The tunnel was partially built by the Hasmoneans in the 2nd century B.C., and supplied water to the Second Jewish Temple. It is located near sites sacred to Judaism, Islam and Christianity. 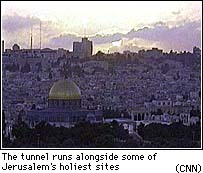 The tunnel runs along the raised platform that is referred to by Jews as the Temple Mount and by Muslims as Haram al-Sharif, or Noble Sanctuary. Two mosques, Al Aqsa and the Dome of the Rock, sit on the mount. Rediscovered in the mid-1900s by the British explorer Charles Warren, the tunnel is less than a meter (yard) wide. Workers began clearing the tunnel more than 10 years ago. On Monday night, the Israelis broke through the last few feet of wall. From the water tunnel, it is a few meters (yards) to the exit opened into the Via Dolorosa. At the new exit, a gray iron door was welded into place. "We can touch the foundation stone of our existence here," Israeli Prime Minister Benjamin Netanyahu said. The Israelis say the new exit will provide easier access for tourists and pilgrims and add to Jerusalem's allure. But for the Arab world, the tunnel's completion signals that Israel plans to undermine the sacred Islamic sites. It is seen as part of a campaign to strengthen Israel's unilateral control in the disputed city. "The Arab League affirms that such actions represent a clear attack on Islamic holy sites and a violation of the Geneva," the group said in a statement.